Over the course of the next few days building up to New Year's Eve, we'll be sharing some of our favorite appetizer recipes with you. This Tuna Tartare is always a hit for weddings and cocktail parties! This sushi-style appetizer doesn't require the skill of a sushi chef, is fairly simple and has few ingredients. 1. Start with fresh tuna that has been put in the freezer for 30 minutes or so (this makes it so much easier to cut). The tuna needs to be cut into a small dice, 1/8" or less. Keep in a chilled mixing bowl. 2. Peel a piece of ginger about the size of your thumb. It needs to be sliced into a very fine dice even smaller than the tuna. It can be done in a food processor as well, it just won 't look as attractive. 3. Mince the chives, you will need quite a bit, I would say about 2 bunches of chives, although the size of the bunches can vary from store to store. 4. Combine the ginger and chives in the bowl with the tuna. Add a pinch of cayenne, a generous amount of salt and lightly dress with 2-3 tablespoons sesame oil. Toss with a fork until well mixed and taste. It should be fairly spicy, remember it is served on cucumber which acts to take away some of the heat. Sample a bit until you are pleased with the combination. The ingredients can be prepared several hours ahead of serving but they should not be combined until an hour or so ahead of time. 5. 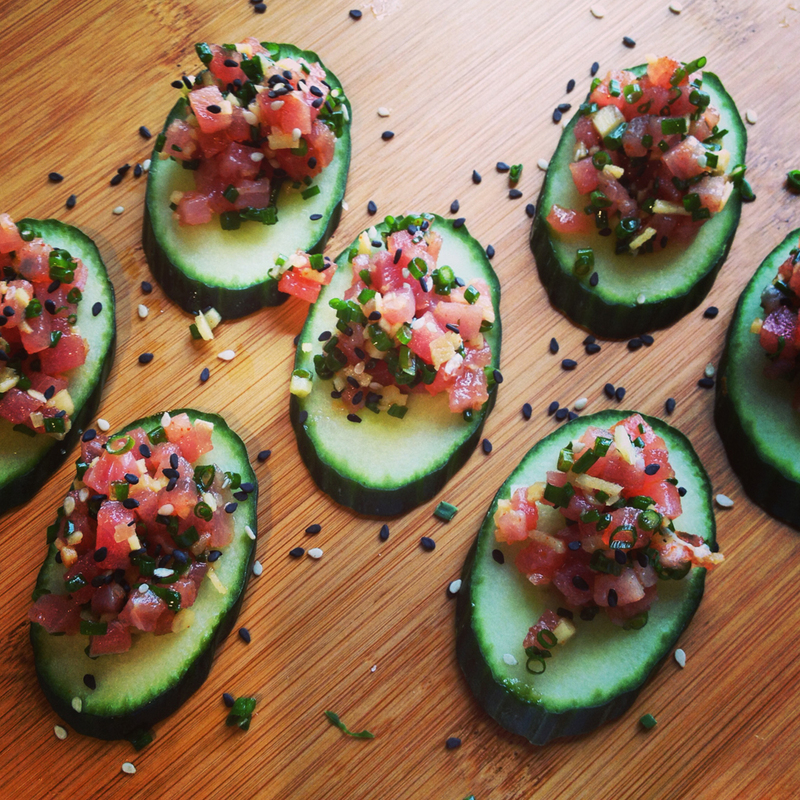 To serve, simply put a teaspoon of tuna tartare on a thinly sliced cucumber and garnish with sesame seeds or thinly sliced sushi seaweed, nori. A sheet of the nori looks great as a base on a serving platter!